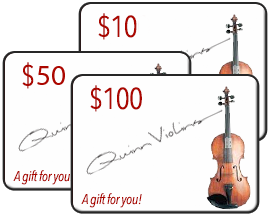 Company mission, vision and philosophy: QuinnViolins.com was founded in early 1998 with one goal in mind; To use the unique advantages of the web to better serve the product needs of the string instrument playing community. Our commitment to serving customers on the web is the main difference between us and our competitors. Mastering the many uses of cutting edge business technology is essential for any organization to succeed in the long term. Key features of our company are; comprehensive product selection, lowest prices available, detailed product information, friendly and prompt customer service and just plain fun. Music is either about education or entertainment. 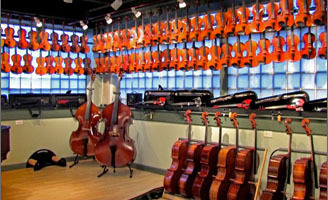 Why, then, are so many retailers in the string instrument business so gravely serious? We are located in Minneapolis, Minnesota. Minneapolis is fortunate to have a strong string playing community. Two world-class orchestras, numerous civic and semi-professional groups, and a commitment to music education make this an ideal place for a violin shop to call home. Our building is in a complex of a dozen structures built and occupied by General Mills from 1908-1980. The lengthy network of tunnels connecting the 290,000 square feet is an interesting feature. Over 50 small businesses occupy leased space. It's inspirational to see so many companies working side by side to meet their goals. Christopher Quinn Profile: Chris is the company's founder and president. He is a cellist and has always been an avid computer user. He began his first retail endeavor in 1987 at the age of 16. Chris is a graduate of the University of St. Thomas in St. Paul, MN where, in 1992 he earned a B.A. degree in Music Business and Music Performance. Because of business demands on his time, Chris' professional musical activities are limited, but he finds time to perform as a freelance musician in the Minneapolis/ St. Paul area.